Update: DICE Producer Jesper Nielsen has confirmed that this leak is legit, and the new Star Wars Battlefront is launching on Xbox One, PS4 and PC on November 17. "If stuff like this happens, we only have ourselves to blame," he wrote on Reddit, where he goes by DICE_TheBikingViking. "However, you would have learned this very soon anyway." He even added a ":)" just to prove he ain't mad. 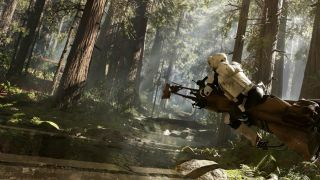 It's been ten years since the last Star Wars Battlefront game was released, but fans will have to wait a little bit longer to play EA's new take on the series. A small glimpse of the game was tacked onto the end of the second trailer for Star Wars: The Force Awakens, revealed during the Star Wars Celebration, but that's not the only surprise fans discovered today. At 1:49 in the video below, you can see footage of the game in a thumbnail. If you click the thumbnail, you'll reach a teaser site where a NeoGAF user discovered Battlefront's release date in the source code. "The latest news and updates for Star Wars Battlefront. Available November 17, 2015 for PlayStation 4, Xbox One and PC," the code for the site's "news & media" page reads. That's probably part of what EA and developer DICE will announce tomorrow during the Star Wars Celebration Battlefront reveal event, and while it could be a mistake, this seems legit. The hype is strong with this one, so hopefully they don't screw it up.